ALL ABOARD !!! It is time for the annual contest to crown the Ticket to Ride of Houston Champion. 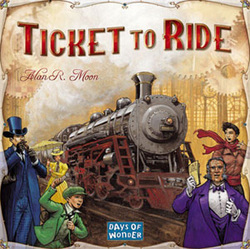 Come and compete through two rounds, each featuring a different version of Ticket to Ride. Finalists will then compete in a championship game to determine who will walk away with the 2015 Champion's Train Whistle (yes, your trophy will be a train whistle with your name on it). New players and all ages are welcome. Play tends to be friendly and fun. This isn't a cutthroat competition - it's more of an excuse to play lots of Ticket to Ride!